The film Tunnel directed by Kim Seong-hoon, which opened a couple of weeks ago in South Korea has surpassed 5 million admissions. For a country that is as small as Illinois, that is quite a feat. The story which would seem kinda of a predictable formula, takes a turn from the usual disaster elements and shines a light on the public’s attitude to the catastrophe, with the news reporters, government types, corporate greed, the waiting wife, and the will of the trapped man to survive. There are no slow spots in the film. Although you can pretty much foresee what will happen in the end, it keeps your attention until you make sure you are right and feel good about it. Ha Jung-soo plays the unlucky regular family maTn Jung-soo, a car dealer who is driving home with a birthday cake for his young daughter. 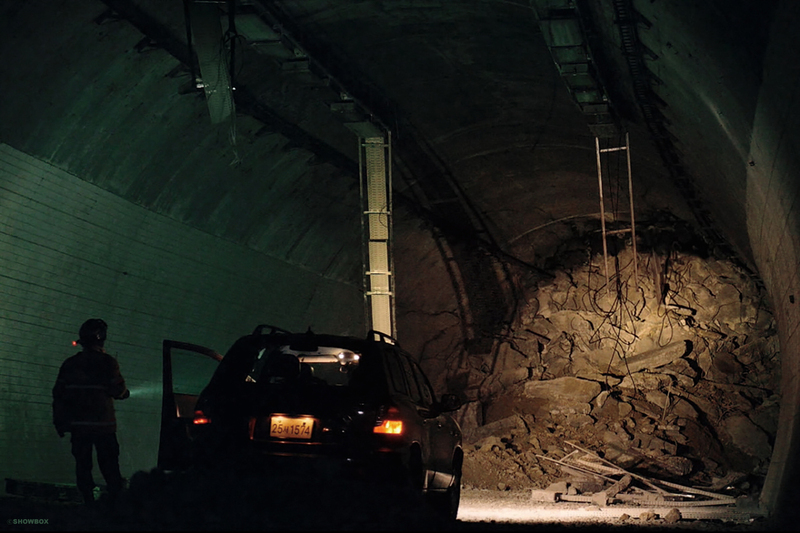 When driving through a recently opened tunnel, everything around him begins to crumble. He wakes up to being covered in dust and rocks and concrete surrounding and crushing his car. He’s got about 82% battery left on his phone, so he calls for help. The emergency response was less than helpful. That is until the response team actually arrives and sees that the whole mountain has totally wiped out the tunnel. The rescue chief Dae-kyung (Oh Dal-su) talks with Jung-soo to reassure him as the man is pretty much in full panic mode at this point. He tells him that the 1 ½ bottles of water he has in the car will have to last him for the next 7 days, his estimate of what it will take to get him out. Jung-soo’s wife Se-hyun (Doona Bae) hears about her husband on the grocery store TV. She rushes to the site being reassured that everything is being done. At this point the place is filled with news teams reporting the disaster and governments representatives are there for photo opts to show the world they are serious about saving their citizen. Jung-soo is told to turn off his phone to save his battery and he will be called every day at noon to check on him. A series of blunders turned the rescue mission to become delayed, and the weather is beginning to turn. The days go by, and the construction companies are beginning to put pressure on the government to let them resume blasting on the new tunnel. When his phone finally dies, it looks like everyone is ready to write him off. 35 days being trapped, even his wife is losing hope. The story, pacing and editing, even the clever camera angles keeps the viewer glued to the screen. Which is an accomplishment for a film over 2 hours. It may be subtitled but the humanity of the film, be it brave, impatient, and determined speaks to everyone no matter what language. The film opens at AMC Grapevine and Cine Oasis.